I know, I know, I promised a Batman Bronze Beauties series, and that’s still coming, but then I remembered that THE INCREDIBLE HULK comes out this week and thought I should stick with my habit of featuring comics that are about to hit the big screen. 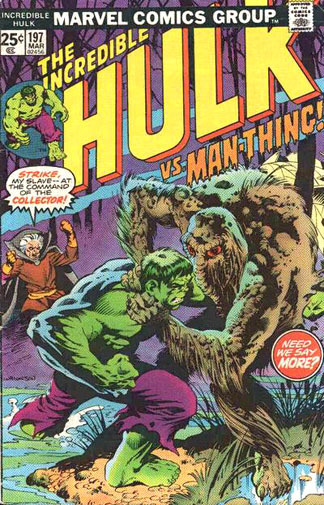 So here’s an entry for Marvel Comics’ not-so-jolly green giant. If I sound underwhelmed about both the character and his upcoming movie, well, I am. As a 1970s-bred fanboy, I had read some Hulk comics and naturally every Friday night at 8pm, I was tuned to CBS as Bill Bixby fought to purge the raging demon that dwelled within him. But the Hulk was always a one-note character to me, never one of my favorites. Part of the problem was his design. It’s really hard to make the Hulk look interesting because he’s just a shirtless, barefoot giant in purple pants who’s usually screaming about himself in the third person (something I cannot abide). The relative proportions of the Hulk’s features have varied widely depending upon the artist. While he was originally drawn as kind of a Frankenstein monster, there were times in the 1970s that the Hulk really looked like a Mego action figure, rather stiff and broad (he was the only character that Marvel art director John Romita couldn’t draw well). Of course, things didn’t get better in the hyper-stylized 1990s as artists started putting the Hulk on gamma-steroids, drawing him with veined tree-sized arms branching from a tank sized torso, often topped with a teeny tiny head. I guess one could make the argument that he’s one of the few mainstream comic book characters that’s been open to such broad interpretations (Batman is another), but few of them have clicked with me. As for the Hulk’s media adaptations, as much as I loved the TV show, even as a kid, I thought the action was kinda lame (and always noticed when you could see Lou Ferrigno’s streaked makeup and green slip-on sneakers). I never saw any of his various cartoons. Ang Lee’s much-maligned 2003 movie HULK (sans article and adjective) was awkward and overwrought, but I thought it was at least interesting (and not just because of the presence of Jennifer Connelly). My pal Chris pointed out that it was a weird juxtaposition of eastern sensibility foisted upon a totally western piece of pop culture. As for the new movie, I’ll go see it, but I don’t have very high hopes. For one thing, is it just me, or does the CGI look even worse in this one than in Lee’s film? Oh, and dollars to doughnuts that shot of Edward Norton smiling with the green hulk-out eyes is the last shot of the film, as he’s learned to control his inner beast. The character, that is, not the actor/uncredited co-screenwriter, whose much-reported involvement in all aspects of the project doesn’t feel like a good omen (remind me to tell you the story of the time I saw him play air guitar at the bar where I work). 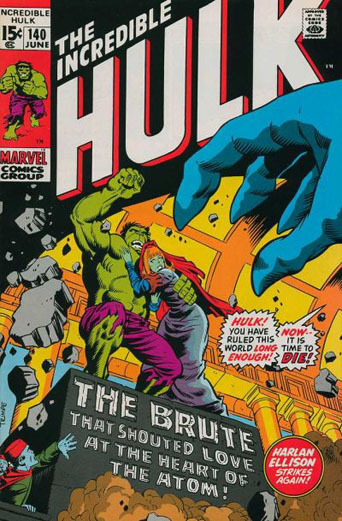 But there are some HULK covers that do ring that sweet nostalgic bell for me and here are two of them. THE INCREDIBLE HULK #140 (June 1971) features a Herb Trimpe cover for a soap operatic tale by obstinate prick Harlan Ellison called (honest) “The Brute That Shouted Love at the Heart of the Atom!” in which the Hulk falls in love with a little green woman named Jarella in a microscopic world called K’ai. #197 (march 1976) pits the anti-hero against Man-Thing on a rare Marvel cover by Bernie Wrightson. They fight. Hulk smashes. You get the gist.